Accreditation: A voluntary process of evaluation and review based on published standards and following a prescribed process, performed by a non-governmental agency of peers. Accreditation applies to training programs. Applicant: A person who has submitted an application to enter the certification process. 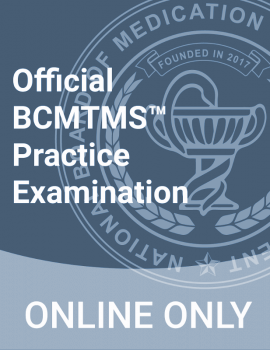 BCMTMS: Board Certified Medication Therapy Management Specialist. Board certification: A process to provide assurance to the public that a certified medical specialist has successfully completed an approved educational program and an evaluation, including an examination process designed to assess the knowledge, experience, and skills requisite to the provision of high-quality care in particular specialty. 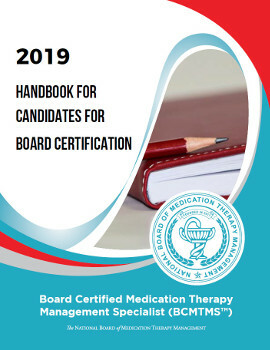 The licensee has met all eligibility requirements as defined by the National Board of Medication Therapy Management and has successfully passed the board’s exam. – Received training from an approved residency program. – Voluntarily taken and passed a comprehensive test of his or her knowledge in a specialty. – Metthe other requirements set by the board that gives the test. – Qualified to take a comprehensive test to become board-certified, but has not taken the test. Certification: A process to provide assurance to the public that a certified medical specialist has successfully completed an approved educational program and an evaluation, including an examination process designed to assess the knowledge, experience, and skills requisite to the provision of high-quality care in particular specialty. Certification applies to individuals. Comprehensive Medication Review/Medication Therapy Review/Medication Review (CMR/MTR/MR): Systematic process of collecting info about specific patients to identify and prioritize DRPs. Core elements: Publication developed by APhA and NACDS to define and outline the critical components of MTMP. Expire Date: The date on which a licensee’s license became inactive. Fee for service (FFS): Payment model where services are paid for based on individual claims for the services provided. Inactive license: Not currently authorized to practice. Licensee: A person who has been approved to practice a regulated profession. Licensure history: An account that shows changes in the status of an individual licensee’s professional license over time. Medication Action Plan (MAP): a patient-centered document containing a plan for patients tracking of self-management. Medication Therapy Management (MTM): Distinct service of group of services provided by a pharmacist to optimize outcomes for individual patients (typically multi or interdisciplinary). Pay for performance (P4P): Payment model where services are paid for based on outcomes. Personal medication record (PMR): A portable and comprehensive record of a patient’s meds (RX, non-Rx, herbals..).